Everyone must have known that apples contain many health benefits. However, if the benefits of 'apple skin' may not have much to know. To be sure, do not waste apple skin. The reason is simple, because the apple skins contain quercetin - a substance that is needed to raise levels of antioxidants, and prevent various diseases. Results of research experts from Cornell University states that only apples, which have quercetin. It just means apple can provide antioxidants equivalent to 1.500mg vitamin C of 'fresh apple extract' from a medium size apple. Then the results of the study also shows, an apple is eaten every day can reduce cholesterol up to 10%. Its phytochemical substances protect against free radicals and reduce levels of bad cholesterol (LDL). And the high fiber, certainly able to withstand the coming hungry. Meanwhile, Dr. Barry Sears in his book The Top 100 Zone Foods declare an apple is a remarkable fruit that can control blood sugar. "Apples are a source of soluble fiber well, especially pectin which helps insulin levels, slow the spending of sugar into the bloodstream. Pectin is also able to reduce cholesterol levels by reducing insulin spending," he explained. All results were, in fact has been proven since the time of mythology. At that time, the apple has been associated with healing diseases of the god Apollo. 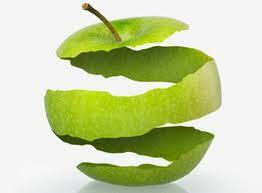 According to the physician Hippocrates and Galen, the habit of eating apples is very beneficial for digestion. That's because the apples that had eaten were mushrooming, and the effect is very good for digestion.